Robert E. Dauphinais Jr., of Dracut, formerly of Woburn passed on Wednesday, October 17th, 2018 surrounded by family at the High Point Hospice House in Haverhill at the age of seventy-nine. He was the beloved husband of 60 years to Marion (Gorman) Dauphinais. Born and raised in Winchester, Bob was the son of the late Robert and Catherine (Queenin) Dauphinais. He was a graduate of Winchester High School. Upon graduation, Bob enlisted in the Army National Guard where he served for 28 years, retiring as a Staff Sergeant. He embodied a selfless service to his country and family without thought of recognition or gain. 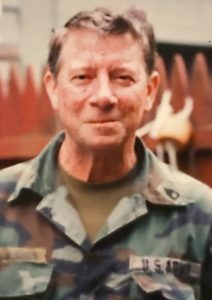 After his retirement from the National Guard, Bob had a long career at McLean Hospital in Bedford. Bob was a warm-hearted and considerate husband; father and grandfather who’s powerfully sweet influence leaves a story of family camping trips, wisecracks, humor, artistry, compassion, patience and Bob-isms. Along with his wife, Marion, Bob is survived by and his legacy will continue through his children, Robert Dauphinais, his wife Mary of NY, Linda Dauphinais and Fred Darling of ME, Kevin Dauphinais and Laurie Donovan of MA, Pam Dauphinais and Mike Fiori of Dracut and Michelle Dauphinais and Jesse Joyce of Amesbury. Dear brother of Dawn McNulty, her husband Kevin of NH, his late brother David and his wife Marcia Dauphinais also of NH. Cherished grandfather of Danielle, Nicholas, Nate, Jill, Phil, Christine, Matthew, Morgan, Ashley and Ryan. Loving great-grandfather of Natalie, Jake, Liam, Finn and Toby. Also lovingly survived by Jerry Brennan, who was like a son, and his wife Susan of Wilmington. Relatives and friends are respectfully invited to calling hours on October 21st at the Lynch-Cantillon Funeral Home on 263 Main Street, from 1-4 p.m. A Funeral will be held from the Lynch-Cantillon Funeral Home on Monday, October 22nd at 9 a.m. followed by a Funeral Mass in St. Charles Church, 280 Main Street, Woburn at 10 a.m.
Interment is private. Final resting place is Massachusetts National Military Cemetery. I am so sorry to hear of your loss. When I think of my childhood memories and the people who were a big part you all and Bob were a big part. I will always remember. My condolences Pam to you and your family. My thoughts and prayers are with you all. Marion, Linda, Bobby, Kevin, Pam, Michelle, and Jerry. I am so sorry for your loss. I have such fond memories of parties and just hanging at 108 Arlington Road. You are all in my thoughts and prayers. Mr. D. was awesome.